Buy this Cleanse Sachet For Kids at RM 88.00 (20% off retail) when you become a member of NewLife International. Mix one sachet of Cleanse Sachet For Kids with a glass of cold or warm water, stir well and serve immediately. To be followed by another glass of water. Children are advised to take sufficient amount of water. Recommended for children 6 years old and above. Keep in a dry place and avoid direct sunlight and moisture. Constipation is never a good thing and it’s worse for a child. Aside from the uneasy feeling, it also says a lot about the state of their health. Monitor your child’s health through the following ways. complain that it hurts when he is passing motion? feel less hungry than usual? Hold-on going to the toilet or avoid painful bowel movement such as squatting, crossing their legs or refuse to sit on the toilet? Your child may be constipated. Does your child pass healthy-looking stools? Faeces can tell you about their gastrointestinal health. This is a normal colour and the result of bacteria putrefaction in the gut and bile excretion from the liver. Changes in colour happen when your child starts taking solid foods. For example, the faeces may look red after they eat beet or it may also turn bluish or greenish from the consumption of food colourings and green leafy vegetables. The picture shows faeces in seven forms which are applicable to both adults and children. Types 1 -3 denote constipation, even with the daily bowel movement. Types 4 and 5 are ideal with the former being easier to pass and not containing excess liquid. You have diarrhoea if you see Types 6 and 7. Healthy faeces do not stink. Constipation is more likely in children who do not have enough fluid intake. As a result, stools move through the large intestines too slowly and it becomes dry and hard. Solution: Fluid is necessary for children who start eating solid foods so give them plain water or fruit juices. However, avoid giving your child caffeine drinks such as coffee, tea or soft drinks as these beverages will dehydrate the body and make them more thirsty. Give your child plain water as often as possible. It’s important for them to stay hydrated in our hot weather. When they engage in sports or outdoor activities, extra fluid is needed. Children like sweet drinks so opt for apple cider vinegar with raw honey or fresh fruit juices. As a general rule, fibre requirement for children aged three and above is five grams plus their age. For instance, when they are six, they would need 11g daily. For adolescents – 15 years and older – they would need to ingest 25-30g daily. As parents, you need to limit your child’s intake of refined foods such as plain biscuits, white bread, cakes and pies and opt for healthier choices like wholemeal or multigrain bread. You can also swap white rice with brown rice. You can also increase fibre in meals by not peeling fruits whenever possible. While adding dietary fibre helps to regulate bowels, doing so without drinking enough water can worsen constipation. To allow the fibre to work, ensure that your child drinks at least 4 to 6 glasses (1 to 1.5 litres) of fluids daily. Solution: Cleanse Sachet For Kids is a great fibre supplement for children aged 6 and up. A child can take a sachet of Cleanse Sachet For Kids once or twice a day if there is no daily bowel movement. Cleanse Sachet For Kids is best taken on an empty stomach and preferably at least 30 minutes or 1 hour before meals. Like adults, a child’s gastrointestinal tract harbours an enormous amount of bacteria. A good balance of good and bad intestinal microflora needs to be maintained for healthy bowel function. Solution: One of the simplest approaches to increase friendly intestinal bacteria is by consuming probiotic foods like yoghurt. Probiotic supplements such as ImmuFlora may also help relief constipation. Probiotics promote digestion and peristaltic movement of the digestive tract. Probiotic produces lactic acid that lowers the pH levels of the colon and aids in regulating bowel movements. The most likely reason the child is still constipated after taking plenty of water, fibre or Cleanse Sachet For Kids may be because they lack friendly bacteria. Add a sachet ImmuFlora together with Cleanse Sachet For Kids and see a difference. Some children may ignore going to the toilet because they are busy playing. Consequently, faeces become hard and dry and difficult to pass. Solution: To counteract this problem, parents should schedule toilet time. Encourage your child to sit on the toilet as soon as they feel the urge. If your child is reluctant to use the toilet away from home, you can help by talking it through or working out a solution with the school. Supplement with Cleanse Sachet For Kids, even if your child has regular or normal bowel movements. It’s more important to do so if your child is eating refined foods such as white rice and white flour products. For healthy bowels, your child should consume sufficient amounts of fibre such as brown rice, wholemeal bread and lots of fruits, vegetables and fluids daily. Even after the kids have stopped taking Kids Klenz, they will continue to have regular bowel movement. However, it is crucial that you make important changes to your child’s diet to sustain regular bowel movement. Kids Klenz also strengthens the immune system. 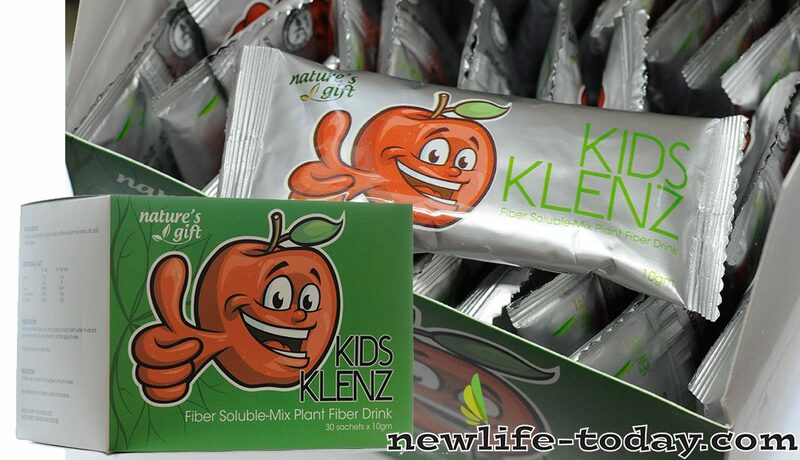 Kids Klenz contains wonderful ingredients such as apple pectin, oligofructose and Stevia. Apple pectin helps to remove heavy metal substances while oligofructose stimulates the growth of beneficial intestinal bacteria. This is tremendously helpful in strengthening the immune system. Stevia inhibits the growth and reproduction of bad bacteria and infectious organisms, which in turn will keep your child from catching a cold or flu.